Tommi, that will work just fine, although a DPDT switch is unnecessary - the "sleeve" connections to all three sockets can be permanently connected together - in fact, it is (nominally) safer. 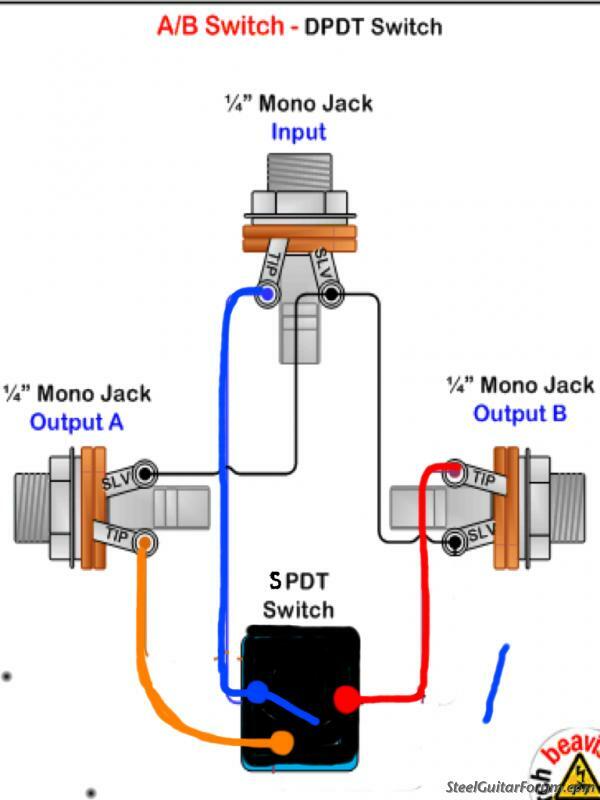 You only need to switch the live signal so a SPDT switch would be fine. But this schematic will not harm your tone at all. The only downside to this is that you have to actually do something to use the tuner - you have to operate the switch. The upside is that you can tune in complete silence. Like this, I think I'm going to build me a pedal! Yes, Tommi - nothing to stop you putting it on your steel, then there's no extra box to connect. A little switch on the side - or better still, underneath, mounted on a small piece of aluminium angle fixed to the endplate, then there is no risk of it getting broken in the case. Right. Snip the wire between the two tips, and maybe rotate jack 3 a bit to give you some room, then run the wire from tip of J1 to J3. There's nothing to the sleeves of J2 and J3 because sleeves are grounded, and they trust chassis ground to do that. Posted 3 Jul 2016 2:51 am Why not just have another jack on the guitar for the tuner? I have two jacks (in parallel) on my guitars and run a tuner full time (Peterson StroboPlus) from one jack and the other going to the pedal ,etc. It doesn't matter if my tuner is turned on or off, plugged in or not, I hear no variation in tone. Problem solved for me! As expected with the StroboPlus, as that tuner has real high impedance input that won't load the PU all that much, and no clipping-circuit at its input that may distort peaks. Not all tuners are that well prepared for direct coupling into a PSG sound-chain, so some may need a resistor in the tuner cable when connected like that. Posted 15 Nov 2016 11:49 am Re: 1 meg resistor-which watt value? I went to a large electronics store today. They had the 1 meg resistors, but they were separated into groups of 1/8, 1/4, 1/2, & I think 1, 2, & 3 watts! I guessed & got the 1/2 watt. Does it matter which watt value to use for this tuner-out application? *...because 1.736V** through 1 MΩ is only 0.003 mW, and a power rating of 1/8 W (...or 1/4 W, 1/2 W, etc.) can satisfy 0.003 mW. Even 5V through 1 MΩ is only 0.025 mW, while 1/8W is 125 mW. **And 1.736V is absolute worst-case, typical for +4 dBu pro-level line level signals. Your guitar signal is instrument pickup level, and probably only 1V (peak), or even less. 1/2 W is fine. Lots of vintage musical electronic equipment employed 1/2 W components. 1/4 W is more common for 70's, 80's, 90's instrument/line level signal, musical electronics. I buy 1/4 W resistors because BOSS, Ibanez, etc. seem to use them everywhere, and they are more than adequate to handle most guitar or effect pedal electronics situations, and I don't have to stock so many different ratings of each resistor value. Plus, the big one is, 1/4 W resistors should be cheaper than 1/2 W resistors. Hi everyone, I'm a new guy but have been playing for a long time and I have a reasonable knowledge of electronics. I modded a dual input amp (4 jack sockets) and wired it parallel to a single set of Hi/Lo input jacks. It the same as connecting a short patch lead between the two inputs. The mod permanently connects the two channels internally. This left me with two spare jack sockets. I fitted a booster switch to one of the sockets and the other I wired as a tuner out. Most tuners I've come across have an input impedance of 1 meg which is why they will load the signal and affect your tone. I used a 2.2 meg ohm resistor which worked quite well and would work in Randy's set up. The reason I suggest this is because when you combine the 1 meg load of the tuner with a 1 meg resistor in your volume pedal mod you get a combined load of 500k on your signal. If you use a 2.2 meg the combined load goes up higher (about 680k). You only need enough signal to drive the tuner so minimal is best. I am definitely not an electronics person. 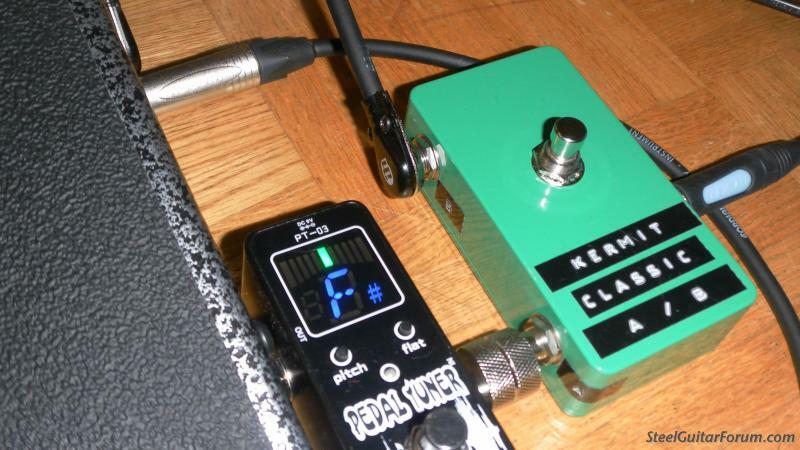 However, I use a Hilton pedal and a Peterson VS-II tuner mounted on my guitar leg. I solved my problem by using the Y-idea. I plug my Boss Tone into my guitar. Then, I plug a solid plug(one male end into the Boss Tone. The solid plug has two female jacks molded into the plug. I then run a cable to the V.P., and a cable to my tuner. After I have tuned, then I unplug the tuner cable from the plug going into the Boss Tone. When I need to re-tune, I simply reconnect. This has worked well for this non-electronics trained player. I use an EHX Next Step volume Pedal it has a buffered direct Output which remains unaffected by the volume pedal = "Direct Output" I use this for my Stroboplus HD tuner. Works a treat. Is there an advantage/disadvantage using solid v stranded wire, which is best? 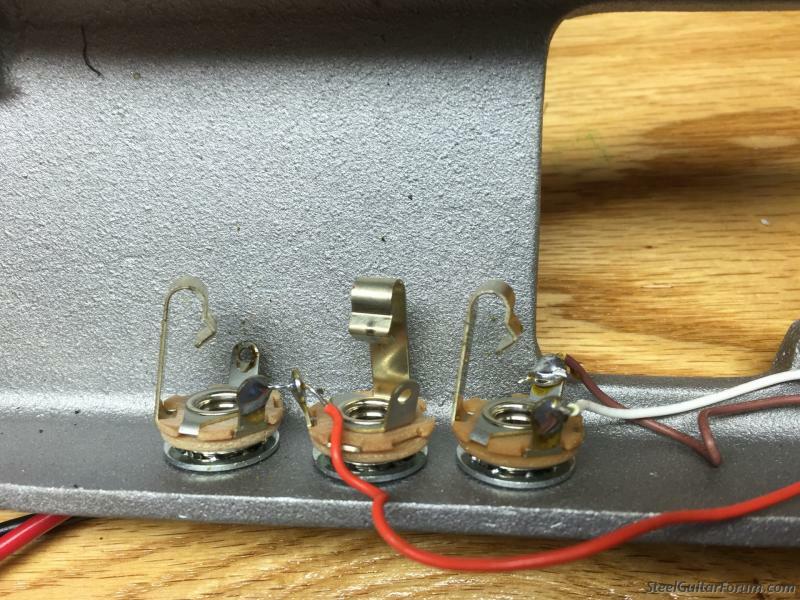 Hi, I'm trying to order a 1 Meg resistors to mod my pedals, does anyone know what wattage I need 1/4, 1/2, 1, 2? A 1/4 Watt resistor is plenty. Won't run currents to worry about through that resistor. George , I have the old EB volume pedal without the tuner out jack so I connect my flip tuner directly to post send of my NV112. It works fine in this arrangement but does it affect my tone in any way.. If so I havent noticed.